ZANU PF political liaison officer for Mashonaland Central province, Maidei Maswi’s 30 hectares of wheat was reduced to ashes by a veld fire last week. The wheat had been planted under the command agriculture programme at Ealing Farm in Mvurwi.Maswi told NewsDay that she managed to save only 10 hectares of the crop from the veld fire, which she said started mysteriously. “We saw a cloud of smoke in the air last week on Wednesday at around 10am at our neighbouring farm and we knew someone had started a veld fire. 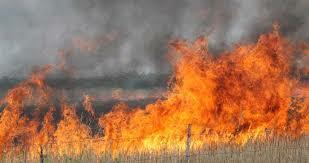 Since it was very windy, we became very alert, but unfortunately, the fire blew into my 40 hectares of wheat. Thirty hectares were written off and we managed to save only 10 hectares,” Maswi said, adding that she could not rule out foul play. The matter was reported to Mvurwi Police Station under RRB number 03074513. Meanwhile, a Guruve woman and her child were killed by a veld fire in September while on their way from a tobacco nursery in Birkdale Farm. Patience Chikowore (32) and her daughter Chantel Mbereko (1) died on admission to Harare Central Hospital. Mashonaland Central Environment Management Agency (EMA) provincial managing director Robert Rwafa castigated those who start veld fires, saying the law should punish them severely by giving deterrent mandatory sentences. “People who start veld fires are destroyers. As EMA, we encourage the government to put a deterrent mandatory sentence like that of stock theft,” he said.